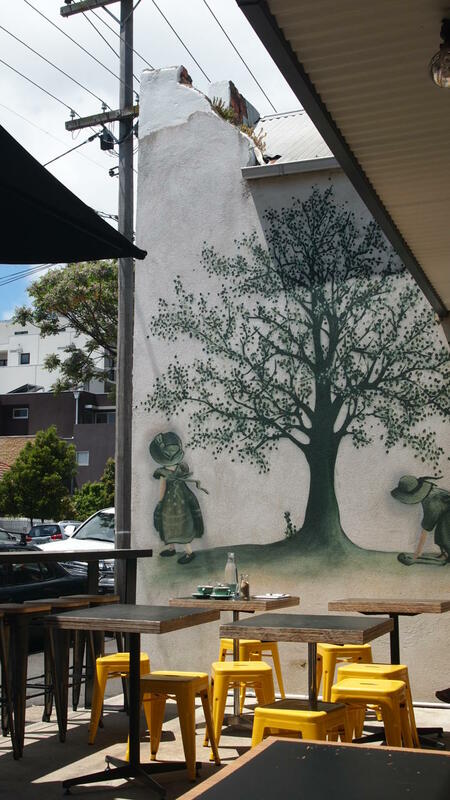 Unlike the nursery rhyme for which this cafe is named, there is nothing destitute or impoverished about Brunswick’s Lucy Lockett. On the contrary, it has a warm community feel to it. To one side of us friendly wait staff work with a couple of locals to solve a crossword, on the other side my heart is warmed by a couple of men speaking their native Italian tongue and opposite us sat a lovely lady with her dog who kept my young son entertained while we ate. Nothing felt forced or fake, there was a genuine sense of community where everyone is welcome and warmly greeted as though they were an old friend. Seated out the front enjoying the first warm day of spring and sipping a coffee, we took our time reviewing the menu. If there was a checklist for all of the standard cafe dishes, this menu would tick every box. French toast – tick. Egg and bacon roll – tick. Smashed avo – tick. Baked eggs – tick. Fritters – tick. Burgers – tick, tick, tick, tick, tick. Although familiar, there is enough variety in the menu to suit everyone. Stick to your diet with an Acai Smoothie Bowl or blow it out of the water with a Wagyu Burger, the choice is yours. Normally one for a sweet brunch, on this rare occasion the Prosciutto Benedict was calling my name. 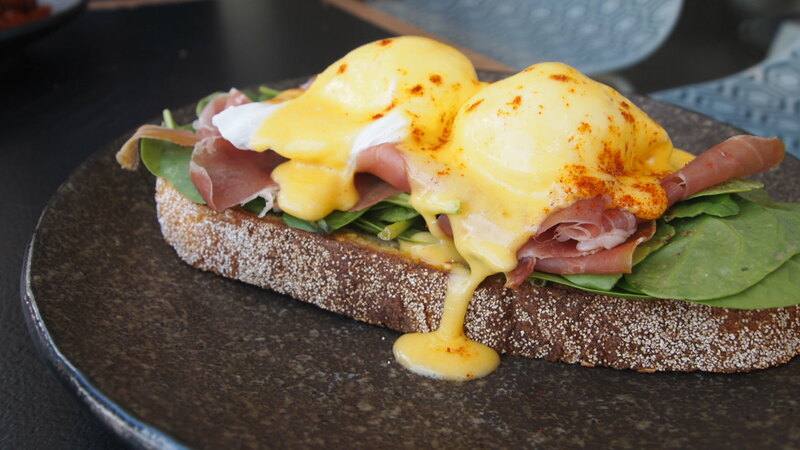 A large piece of dense pumpkin bread was topped with baby spinach, good quality prosciutto, two perfectly poached eggs and some of the most delicious hollandaise sauce I’ve tasted in a while. I wouldn’t call myself a massive fan of hollandaise however this version was enough to win me over. Rich, creamy and tasty, with the help of the pumpkin bread, I mopped up every last bit of it. I’d definitely come back to eat this Benedict again, fingers crossed it’s made a permanent menu item and not just a special. 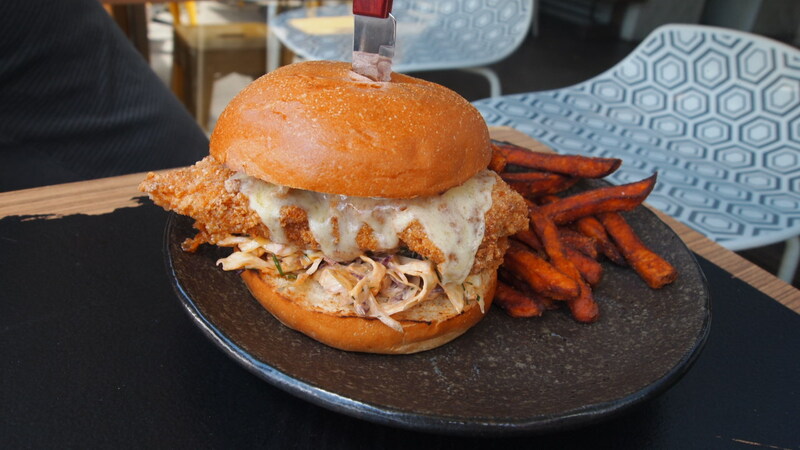 With a few burgers on offer, we decided to give the buttermilk chicken a crack. 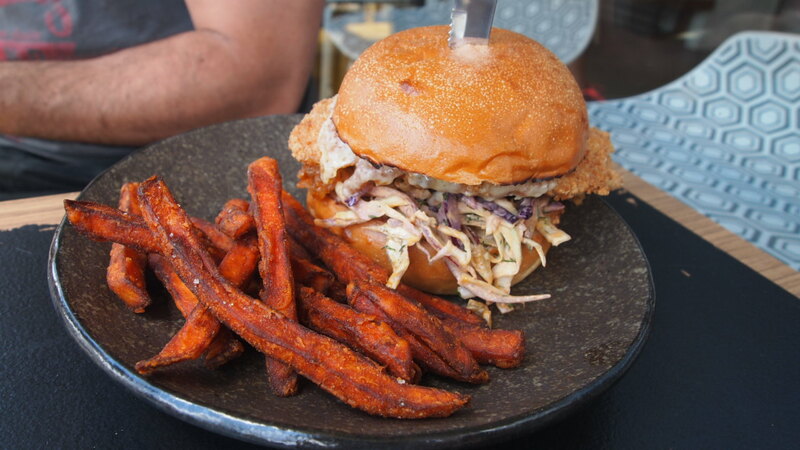 Quite a simple burger, the crisp and juicy chicken patty sat on a bed of spicy slaw, sandwiched in a soft milk bun. Like the Benedict before it, the burger made for really good eating, I think the husband more or less finished eating it in the time it took me to take my customary photos. Served with a side of crunchy sweet potato chips, the burger was almost overshadowed by these insanely tasty chips. Sweet and salty they could easily be eaten as a meal on their own. Based on this visit I’d say the tables have definitely turned for poor little Lucy Lockett and she’d probably be very proud of her namesake.